Third letter of the Hebrew alphabet, so called, perhaps, because the shape of the letter in the ancient West-Semitic script bears a resemblance to the neck of the camel. 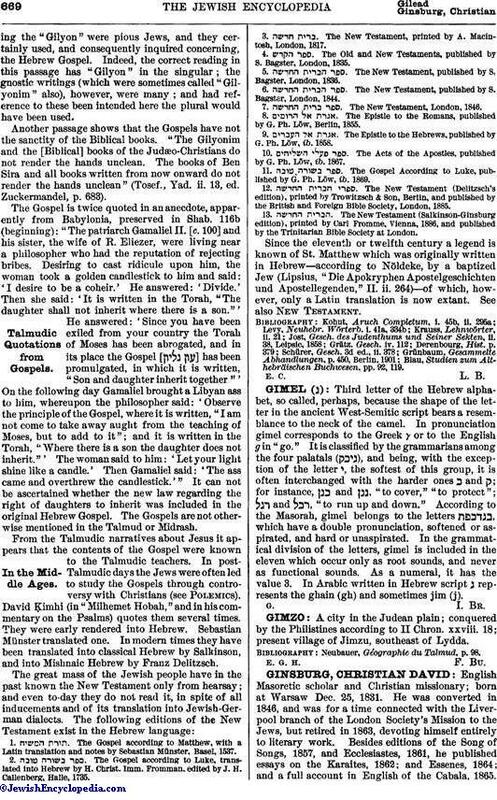 In pronunciation gimel corresponds to the Greek γ or to the English g in "go." It is classified by the grammarians among the four palatals ( ), and being, with the exception of the letter י, the softest of this group, it is often interchanged with the harder ones ב and ק; for instance, and , "to cover," "to protect"; and , "to run up and down." According to the Masorah, gimel belongs to the letters , which have a double pronunciation, softened or aspirated, and hard or unaspirated. In the grammatical division of the letters, gimel is included in the eleven which occur only as root sounds, and never as functional sounds. As a numeral, it has the value 3. In Arabic written in Hebrew script ג represents the ghain (gh) and sometimes jim (j).